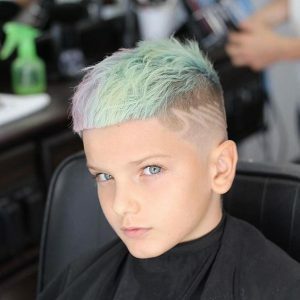 With so many options to choose from in different lengths and colors, there’s a huge variety and a diverse range of hairstyles boys can choose from. 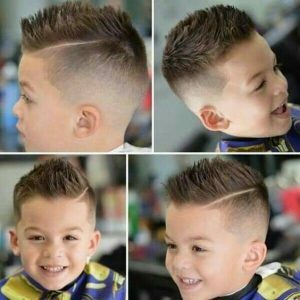 Hairstyles for boys and men used to follow fairly strict rules about what was and wasn’t acceptable, but today pretty much anything goes. Fades and undercuts have enjoyed enduring popularity thanks to their mixture of easy styling with sharp looks, but long and mid-length haircuts are also loved by guys who choose to embrace the waves and curls of their hair. 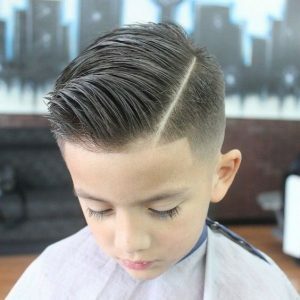 To get a look at all of the modern and trendy guys haircuts and hairstyles there are to choose from, take a look at 50 of our favorite boys’ styles. 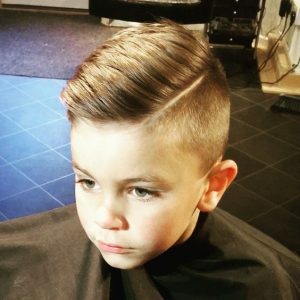 Boys haircuts that are longer on top and much shorter at the back and sides continue to be super popular looks, because they allow your boy to play with styling while still looking fresh and edgy. 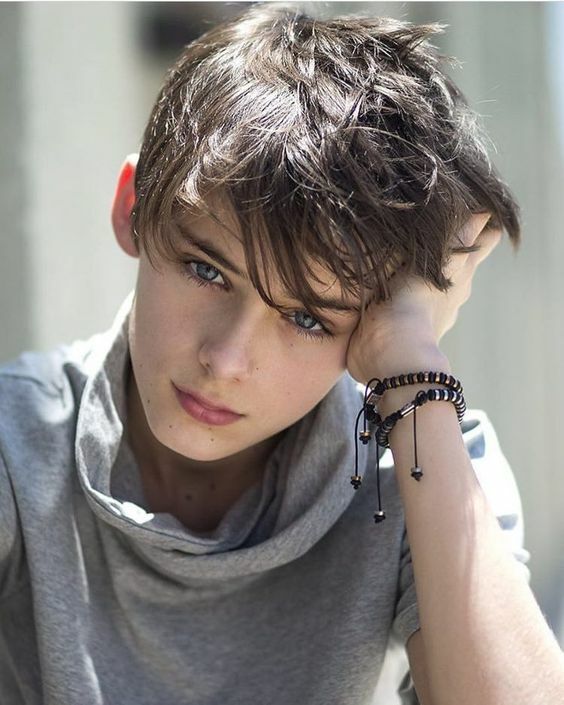 This disconnected haircut has an added contrast of color between the different lengths of hair, with longer blonde strands popping against the shorter, darker hair. 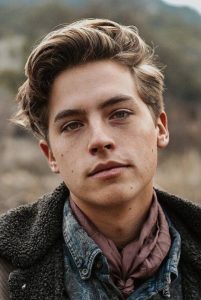 The classic pompadour hairstyle is usually rigidly sculpted into place, but this modern version makes use of a more subtle styling technique that looks soft to the touch. Add in faded sides and a hard part and this pompadour is planted firmly in the 21st century. 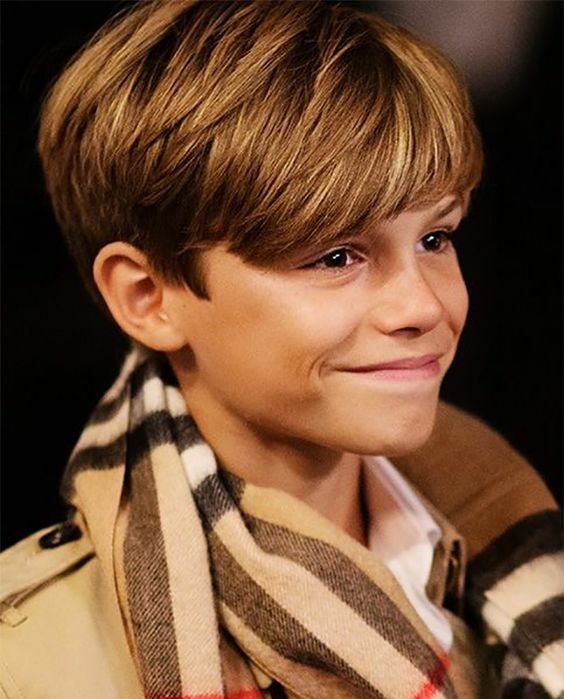 This short fade cut blends hair perfectly between various short lengths, and features a perfectly clean line around the forehead that makes the look impeccably stylish. Perfect for if your little boy wants to try something new, this swept mid-length style is a popular look that’s halfway between short fades and medium length hair. 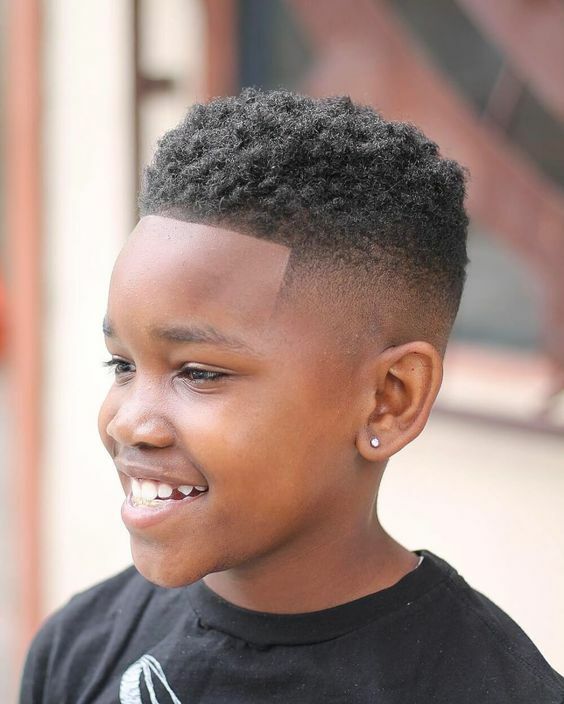 If your boy has got naturally curly hair, this fade cut will allow to show off that texture while keeping some of his hair short enough to not require extra styling. 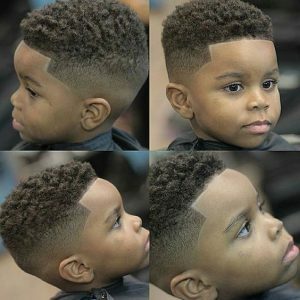 Beginning a fade lower down the head is a nice option for setting a boy’s hairstyle apart from the pack. And by actually disappearing completely into the skin, this bald fade can create the illusion of a longer and slimmer face shape. A simple ivy league haircut leaves enough hair on top to be styled but tapers down around the back and sides to make daily upkeep easy. This cut is super stylish and elegant and looks great on round face shape. 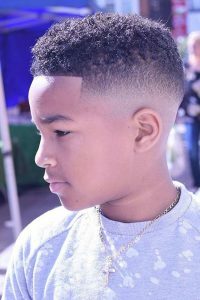 Thick hair with a wavy or curly texture can be difficult to manage, which leads lots of guys to keeping their textured hair super short. 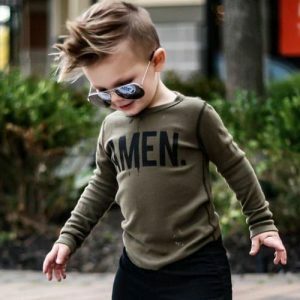 But growing hair longer can actually make this type of hair easier to deal with, as it allows you to play with different parts or tie hair in a ponytail or bun to keep it out of the way. 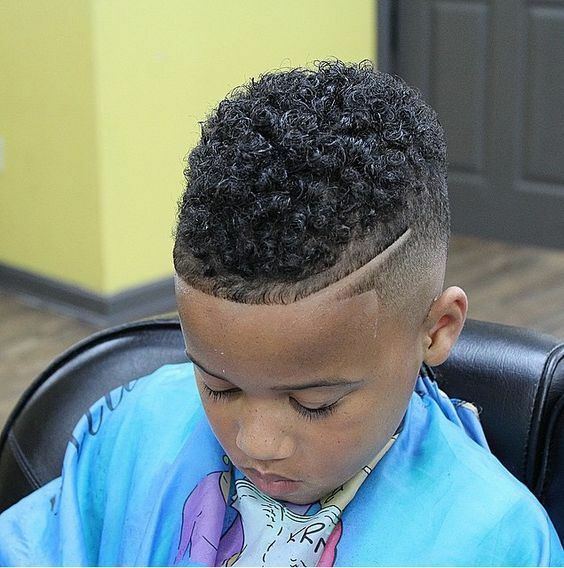 Defining and twisting your boy’s natural curls takes any basic curly hairstyle to the next level. 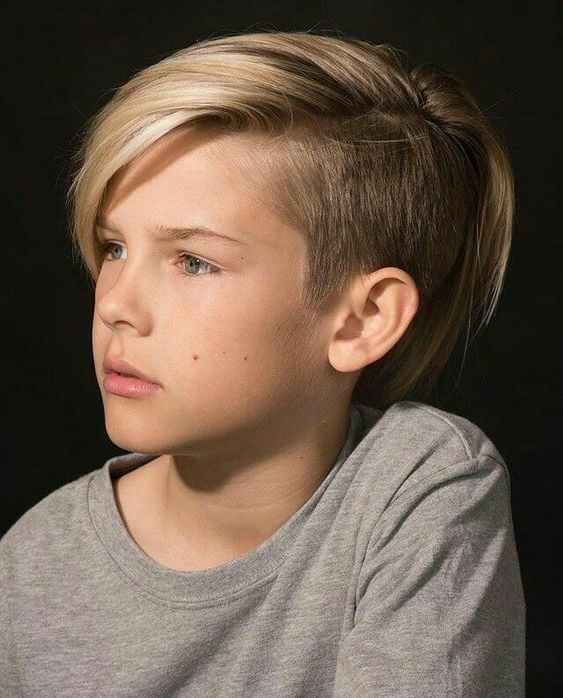 Looking inspired by a ’90s boy band hairstyle in the best possible way, This haircut features longer hair on top that cuts down to a nice manageable length around the sides. Wear this haircut with a bit of stubble to add some edge to the dreamy-looking pop-star style. 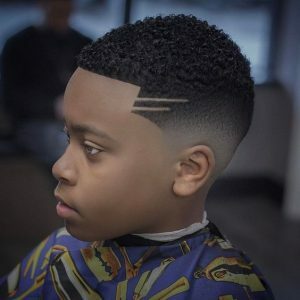 This high fade haircut is another example of how angles in your boy’s hair can define his face shape. Squared edges around the longer hair on top of this style, help to balance out the jawline and make cheeks look more chiseled. If you’ve been thinking about growing your boy’s wavy hair longer, the dreaded in-between period might be stopping you. This mid-length haircut is a great style to aim for, and keeps things manageable with slightly shorter hair around the sides. Fade cuts come in so many different shapes and variations, meaning you shouldn’t ever be bored of this classic guy’s hairstyle. This cut ditches the traditional symmetrical fade and uses a razor line to outline a curved faded section. 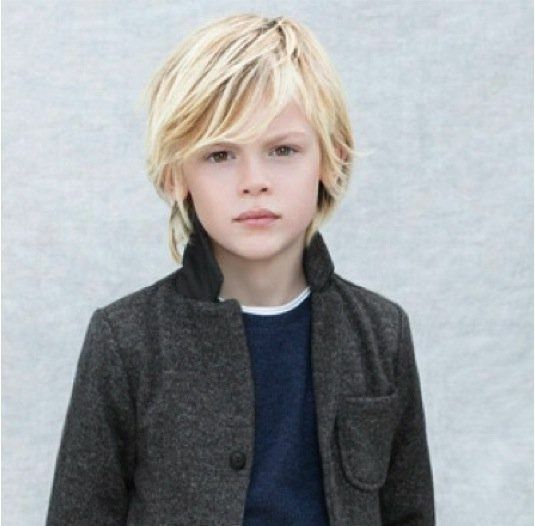 Younger boys looking to experiment with an eye-catching style can easily wear this look in their everyday lives. Stylish and simple, this hairstyle mixes longer hair on top with tapered sides to create a haircut that’s been worn pretty consistently over the last few decades. 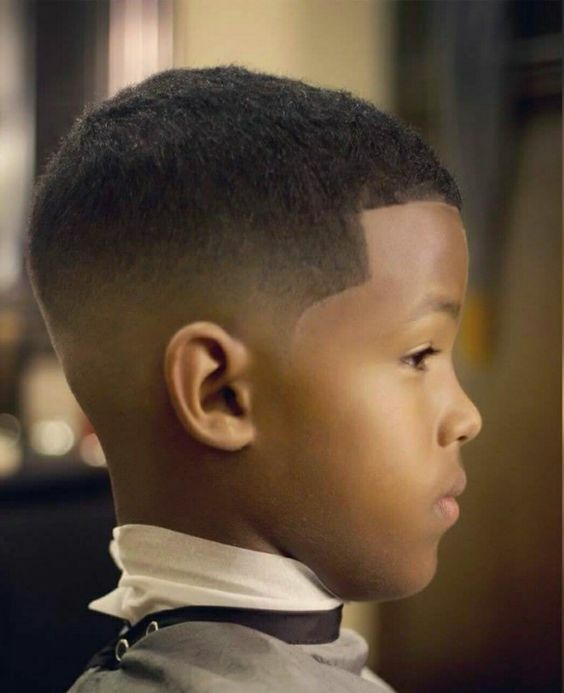 The opposite of a squared off fade style, this haircut brings the fade up higher towards the center of the head, creating a peaked style that helps to lengthen the appearance of the face. 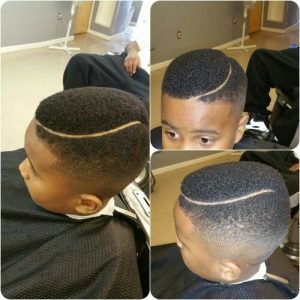 If you’re looking for a way to put a new spin on the fade hairstyle without drastically changing your hair, this is the perfect cut to go for this year. 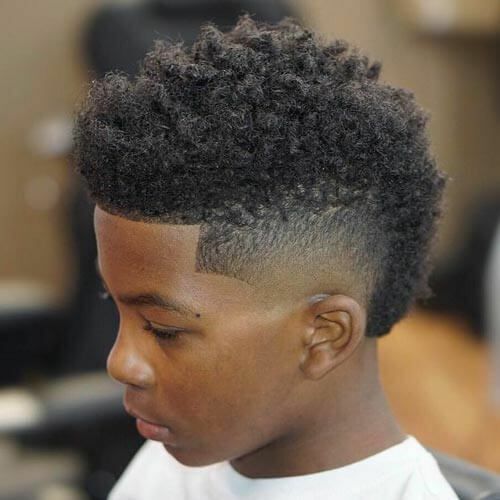 Unlike a traditional mohawk that’s fully shaved at the sides and spiked or styled upwards, this curly cut uses softer styling for a more modern and approachable take on the look. 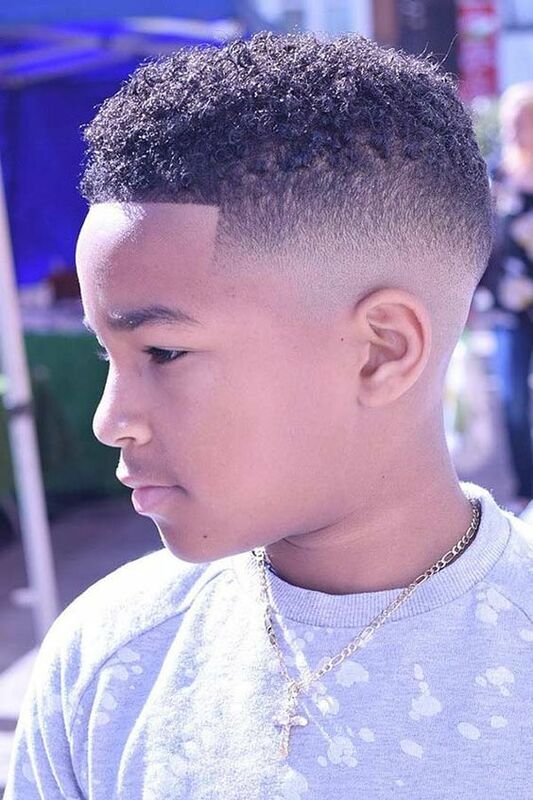 To keep your boy’s curly hair looking nourished and smooth, we recommend using a curl defining product or leave-in conditioner with this style. 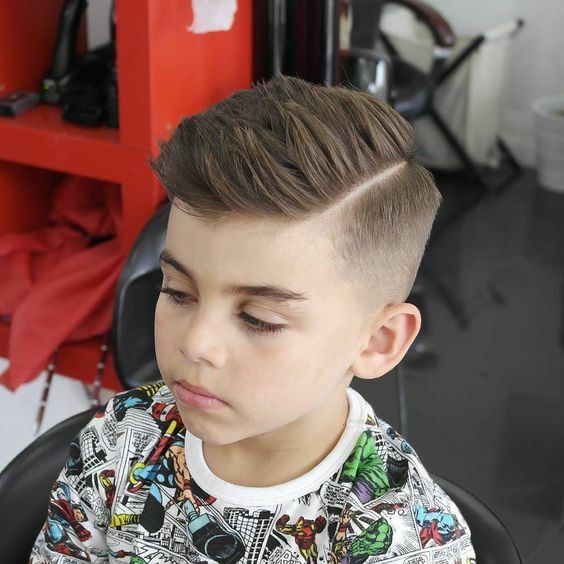 For guys who are all about mixing vintage and modern, this comb over haircut adds length on top to make it look ultra modern and trendy. Don’t choose this style if you’re looking for low maintenance, as you’ll need to spend time styling your hair to get it looking just right. Long layered hair makes for the perfect California chill hairstyle and can be worn with minimal styling. 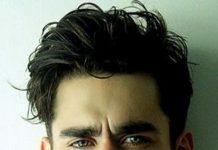 Guys with textured hair that tends to frizz may want to invest in a leave-in conditioner, which can help keep longer hair looking silky. This toned down comb over cut features a soft part that’s easier to maintain than a razor line shaved into your part. A skin fade around the sides brings some modern edge to this style, making it look more trendy than a simple businessman style cut. 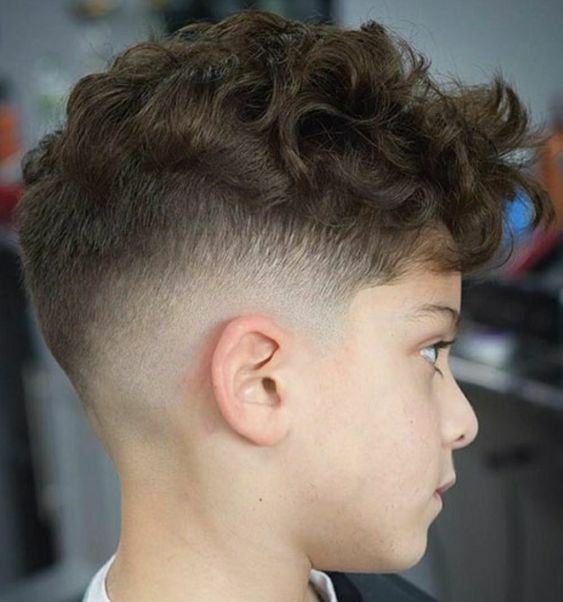 Natural curls are left at the perfect length to add texture and height to the top of this fade haircut. 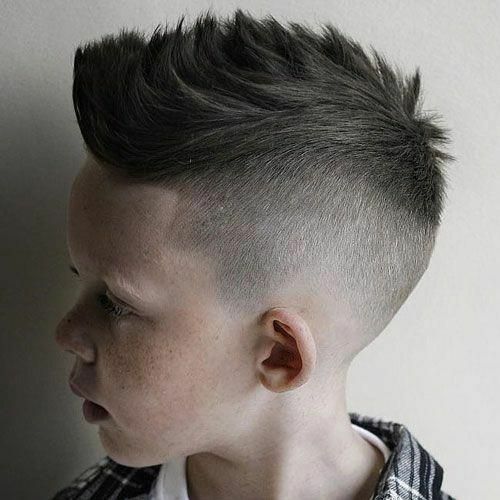 We love this look for younger boys who want their hair to look fresh without being boring or stuffy. 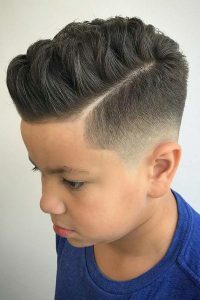 If your boy has got thicker hair that’s difficult to manage, a classic minimalist style like the crew cut can keep you looking dapper without spending all of your time in front of a mirror. 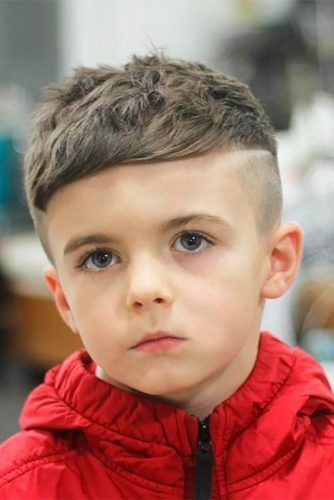 This edgy boy’s haircut is a great example of how a short hairstyle can have tons of artistic flair. A choppy, textured fringe frames the face and adds height on top, while a low disconnected undercut brings in a surprising dynamic of textures. Boys could technically wear this cut with any hair texture, but straight hair feels like the perfect way to show off the daring new style. 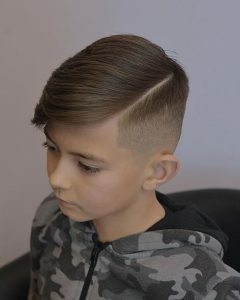 Sweeping hair back can help to open up the face and makes this haircut work for anyone who’s willing to put in a bit of styling work. 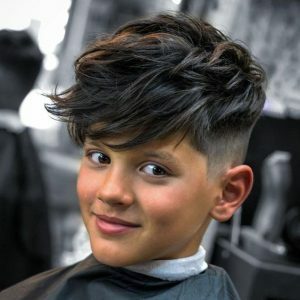 Instead of letting your boy’s hair air dry and then trying to force it back, blow drying the hair into position can make this style a lot easier to get right. Curls and a skin fade create an interesting dynamic and make thick, textured hair easier to style for guys who want to look stylish without spending too much time in front of a mirror. Mixing braids with an undercut is a perfect way to wear two of your favorite hair techniques at once. Whether or not you opt for this intense razor line detail, it’s an interesting look that lets you stylishly pair different lengths together. 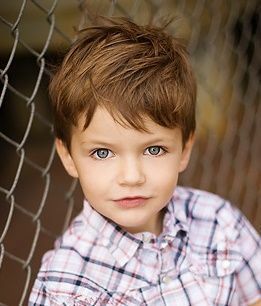 This young, trendy look mixes an undercut with longer hair on top that has tons of messy texture to play with. Whether or not your little boy is natural ginger, this hairstyle has just the right amount of length and texture and creates a super fashionable and cute look! 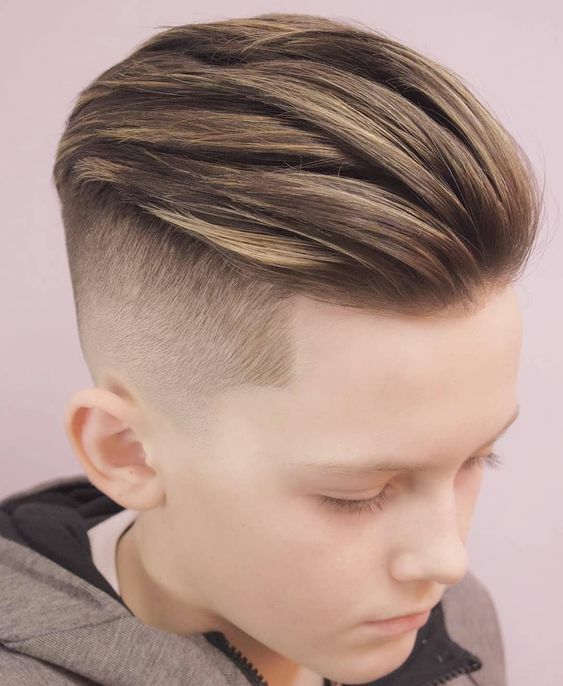 A low fade provides more varied texture to this style and makes it possible for more of the hairline to be defined with this a clean shape up technique. This haircut works for boys of any age who want to look clean, classic, and stylish. A modern update on the faux hawk combines the textured hair on top with undercut sides, making the haircut easy for everyday wear. Soft layers help to control these long curls and creates definition that keeps this style looking casually tousled but not completely messy. 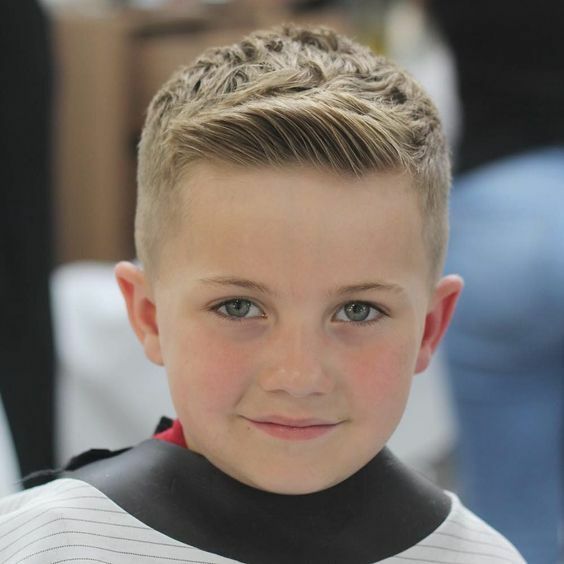 The modern quiff style takes fun and height to the next level and looks, even more, gravity-defying when worn with hair that’s kept super short around the back and sides. 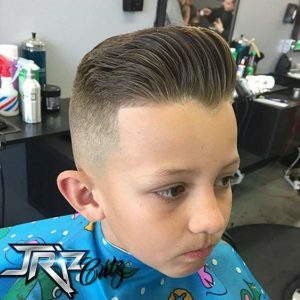 Here we have modern fade cut. 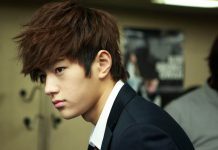 The sides are faded down more on the sides and back while the front is soft, bouncy, and pushed back. This cut totally reminds us of grease. 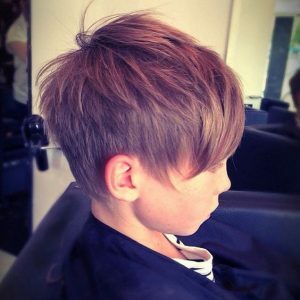 It is slick and volumized with precise lines and very clean cut. This would look great on boys with more narrow face shapes. 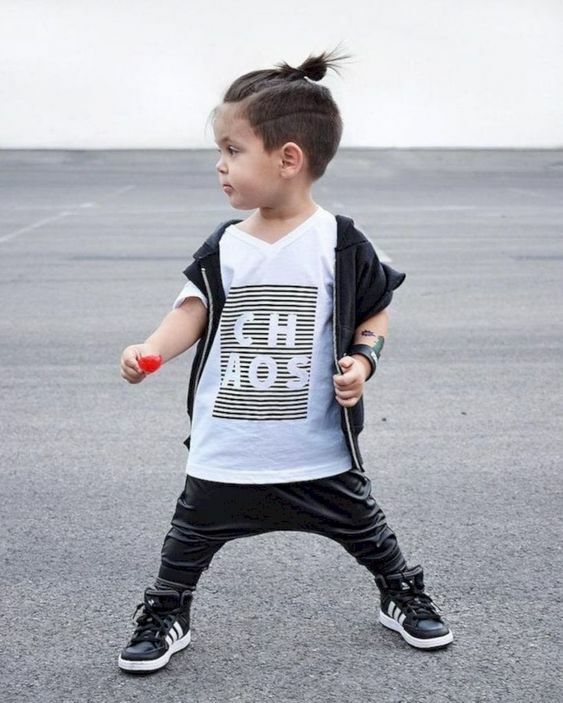 The mohawk is making its way back into the fashion world. Many boys are wearing their natural textures and adding more designs and textures to their look. The short curly fro will never go out of style. You can modernize your little boy’s boring fro by shaving the temples down to give a faded effect. You can also get a sleek and wet look by adding your favorite gel with a bit of water and oil. 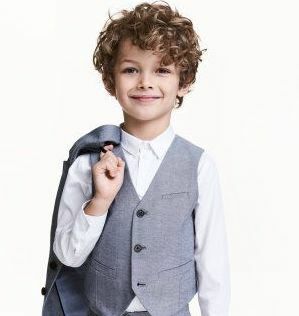 Dapper is the new trend. Look sharp in all of your event photos by trying out the neat and slick style. It is styled to the side so make sure to get your boy’s good side. 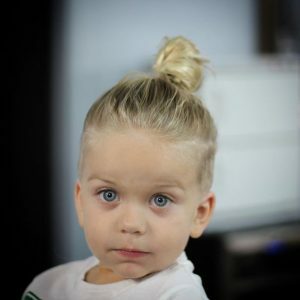 Boys wear buns too. If you’re into minimal or high fashion then this style has probably been on your radar. Adding an undercut makes this look even more masculine. Crazy colored fade cuts have been a huge thing this year. 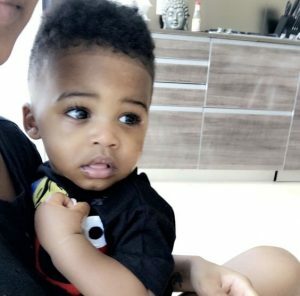 One of the most popular celebrities decided to try the trend himself. This style features a teal and purple colored fade cut. We also love the design on the shaved sides. 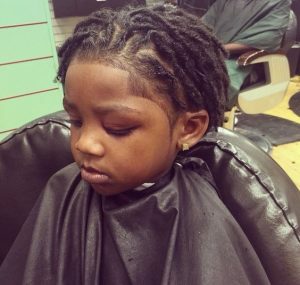 Women have not been the only ones getting faux locs. Men and boys have been experimenting with faux locs a lot this year. We can thank rapper Fetty Wap for bringing it mainstream for the men when he introduced us via Instagram to his golden colored dreads. 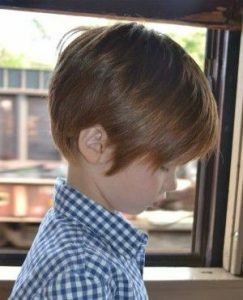 Guys for some reason shied away from the simple ponytail, but for little boys it looks really natural. It has really come back in style especially for little boys who play sports. 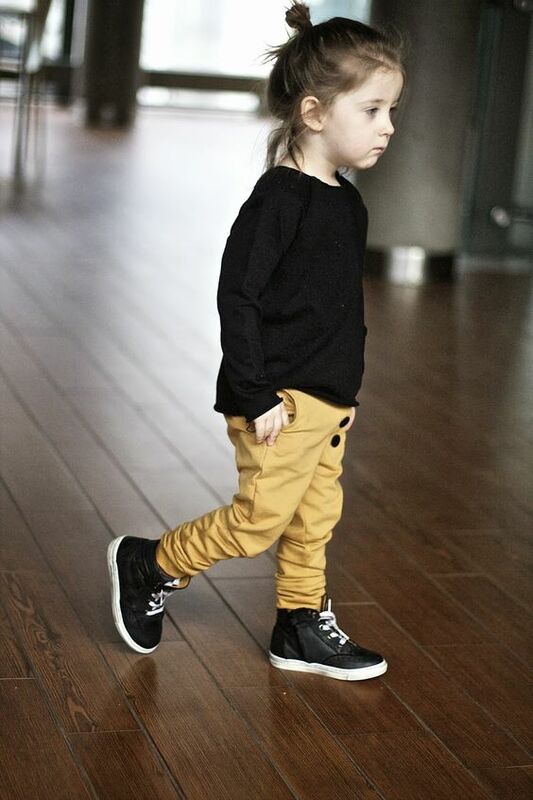 We have also seen them paired with certain styles such as blazers and button downs. How gorgeous is this look? 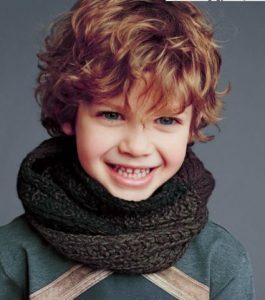 It’s a simple and great way to style your little boy’s hair without too much effort. This half up and half down look has been very popular this year. It is so simple that anyone can do it. 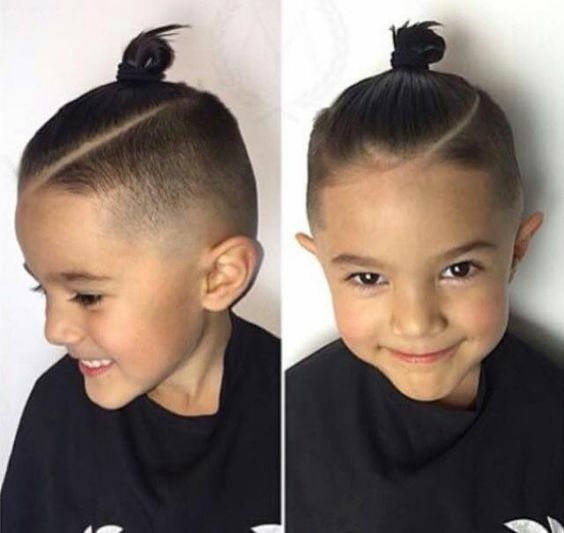 Guys have been really rocking undercuts. 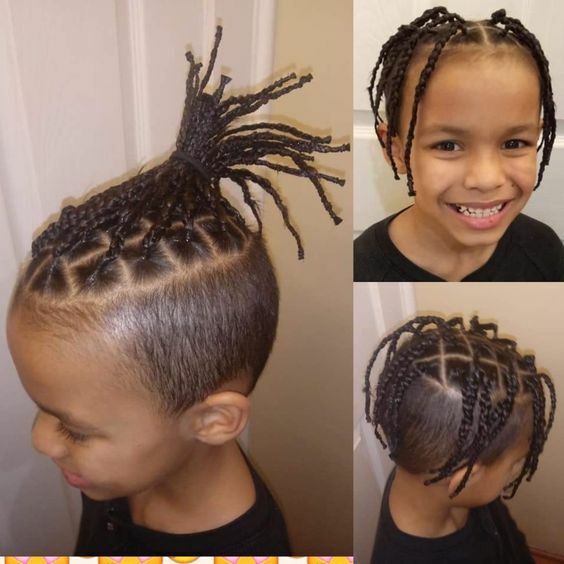 This specific one is styled with cornrows and placed in a knot. The shaved sides really sets off this look and pull it together. 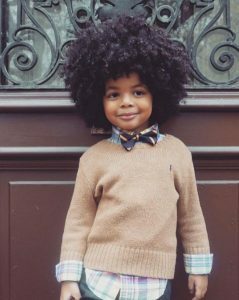 There is nothing wrong with learning to take care of your boy’s natural hair. 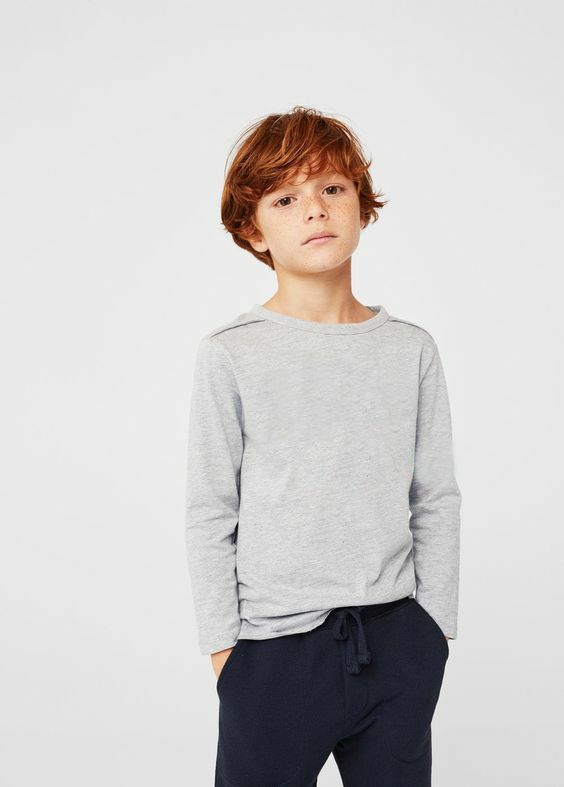 Boys usually just go with the flow. 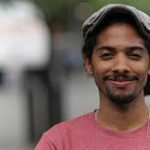 Take time to learn your boy’s hair and what products their hair likes and achieve amazing curls like the ones pictured. Get frequent trims and edge ups to keep the look fresh and modern. A popular 90s cut that made its way back in 2015 is inspired from the movie house party. 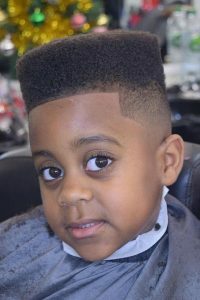 Kid was very popular for his super high flat top cut. 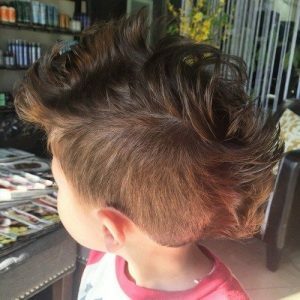 If you have the patience to grow your hair this high then definitely give this cut a try. It is definitely a head turner. The juice cut was also popular in the 90s and many guys and celebrities like Soulja Boy went back in time. If you were a fan of Tupac then you likely have envied this cut for a while. Justin Bieber may have moved away from the bowl cut, but they’re still in style. This day in age they are slightly different. Many guys have made them thinner and added a few layers for the cool school boy look. This makes it look more mature. 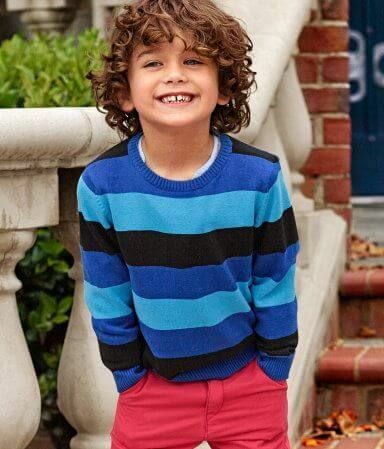 We love this simple curly cut. It is perfect for every occasion. It is not too formal or informal and can easily be manipulated to fit any style, face shape, or scenery. You can get these soft curls by using the pin curl method. 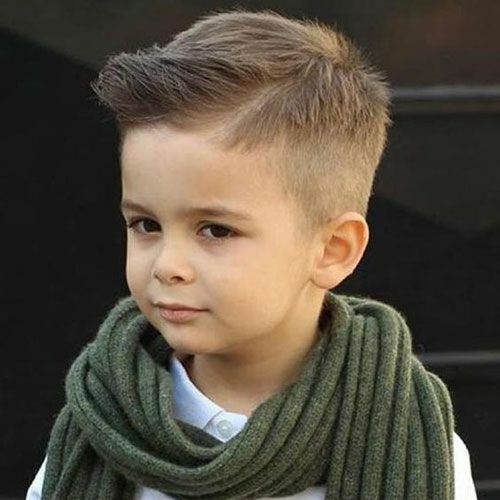 If you’re on social media then you may have seen many of the hipsters rocking this style. It is a simple undercut with dreads at the crown. 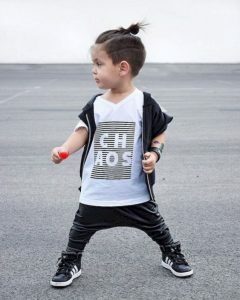 This style is unique and fashion-forward and doesn’t require a lot of growing like other dreaded styles. Boys can get blowouts too. If you like the musician style look then get a blowout and you can add some natural tone highlights. 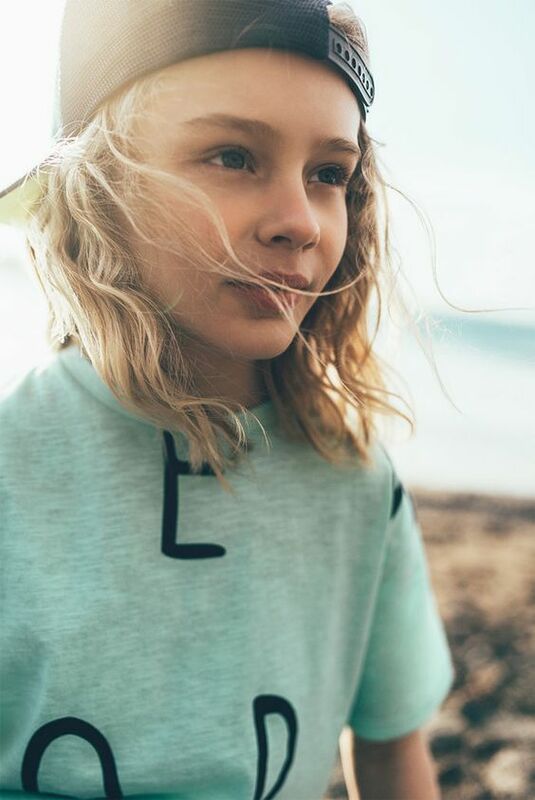 Super long and wavy styles are totally in. 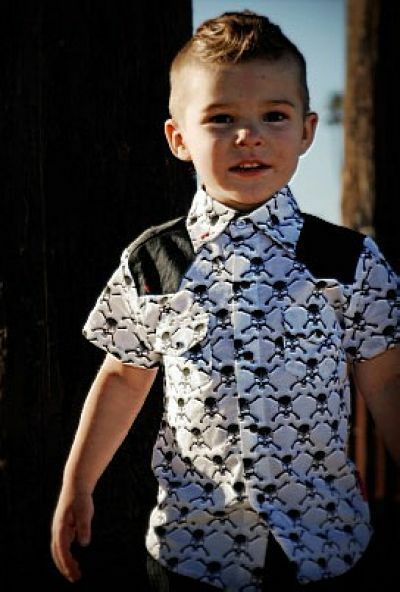 If your little boy is into the beach and surfer look then don’t cut off his hair. 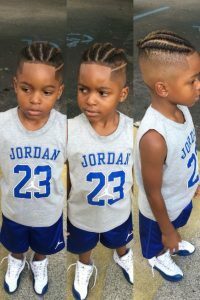 He can wear it in its natural state and style it with french braids, ponytails, or buns. 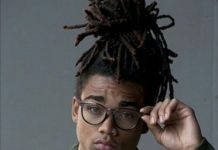 We love seeing dreads placed in top knots. They look very high fashion and are easy to maintain. 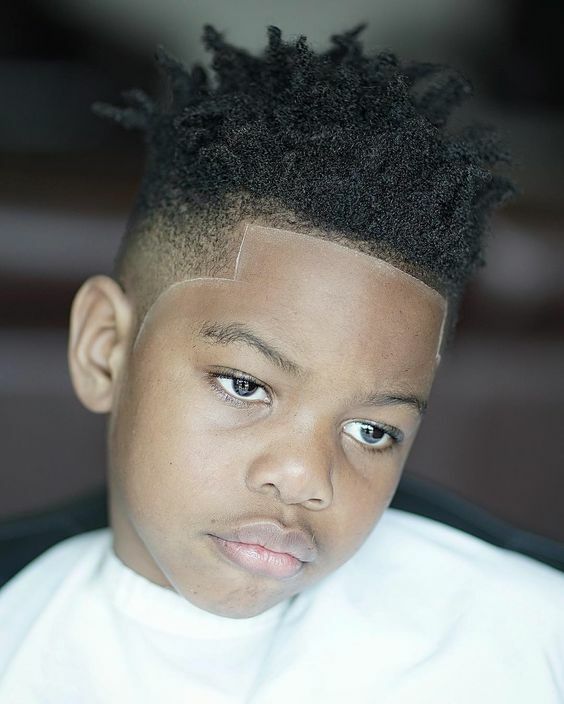 Tip: Take down your little boy’s hair at night to refrain from the pulling of your edges.